Johnathan Post has a very impressive new method for seeing 3D content on video screens without shutter glasses. While there are some obvious reasons why this particular method isn’t going to catch on, I really am vastly impressed with his ingenuity. HackaDay has a fun little project up for those of you who play the guitar and have a do-it-yourself mentality. This little device can be used like a guitar pick. Using the buttons to select your note will cause the LEDs to flash at that frequency. The light will only be visible on the string when it’s in tune. Or, for around ten bucks, you can save yourself some time and buy one pre-made. Light Writer is an iphone app that displays flashing lights in order to create a persistence of vision effect. 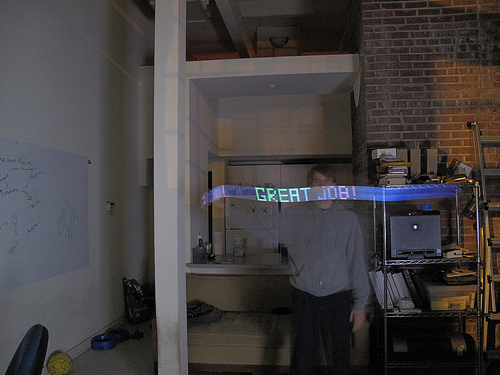 It allows you to write messages or images in the air with a wave of the hand. It sounds like a great way to quietly send a message to anyone in sight. I imagine it would only be effective in pretty dark conditions ,but I’m betting we haven’t seen the end of this app. It could be big. Available here via itunes. A joint project between James Auger and Jimmy Loizeau, the Augmented Animals Project seems like a joke gone nearly right. With ideas ranging from stealth jackets for whales to acorn locating wrist worn GPS for squirrels, these guys couldn’t possibly be serious, but amidst all the projects that suggest there were too many joints in this joint project, there are a few winners. 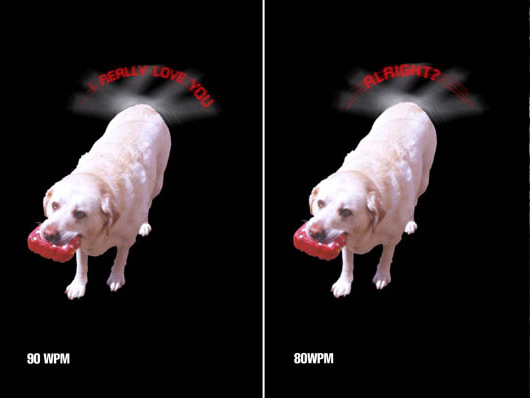 Most notably this wagometer tail ornament for dogs. 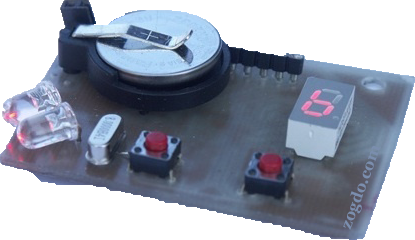 Ostensibly a translation device, this LED stick uses the same persistence of vision trick seen in novelty clocks, and dozens of other recent devices. In the end it really just makes your dog look even goofier than usual, but it will also get them a lot of extra attention which will not only make them happy, but could also keep them safe from drivers on their daily walk.